An ecosystem is a biological environment consisting of all the organisms living in a particular area, as well as all the nonliving, physical components of the environment with which the organisms interact, such as air, soil, water, and sunlight. As an ecosystem can cover a very large area, biologists can use another term to describe where a particular community of organisms lives. This interaction between a community and the abiotic factors, the particular habitat, can be thought of as a biotope. Some parts of the earth have more or less the same kind of abiotic and abiotic factors spread over a large area creating a typical ecosystem over that area. Such major ecosystems are termed as biomes. 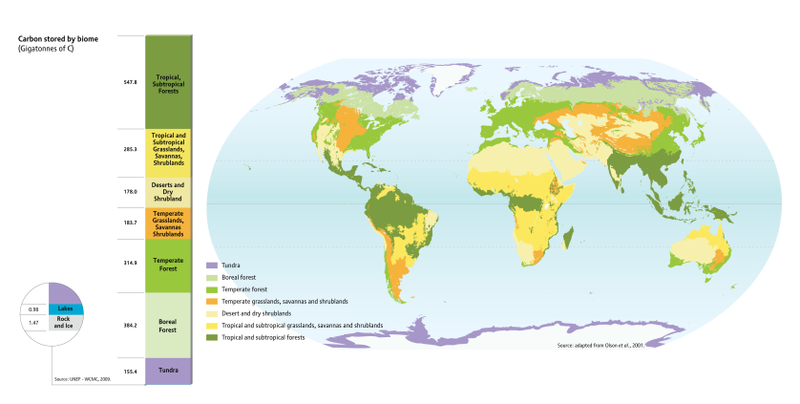 Biomes are defined by factors such as plant structures (such as trees, shrubs, and grasses), leaf types (such as broadleaf and needle leaf), plant spacing (forest, woodland, savanna), and climate. Here below you see a map of the world and the different biomes are coloured, do you see similarities? Which abiotic factors do they share? A biocoenosis describes all the interacting organisms living together in a specific habitat. Which interactions do you see in the following illustration? Interspecific interactions result from the fact that organisms of different species in a community interact with each other. This could be a lion hunting an antelope, moss growing on a tree trunk but also bacteria living on your skin. They are classified according to the effects that individuals of interacting species have on each other, using symbols: – (negative effects), + (positive effect) and 0 (no effects). 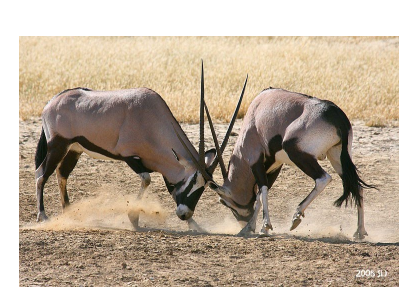 TASK: Can you state 2 examples of each type of interspecific interactions named above? Intraspecific interactions refer to the interactions between individuals within the same species. 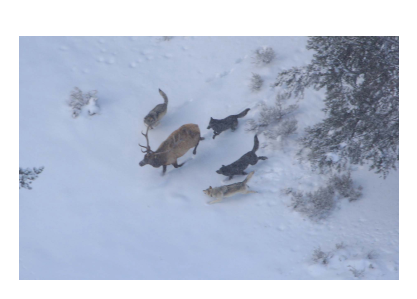 This could be for example wolves cooperating while hunting (cooperation) or bears fighting with each other for their territory (competition), lions teaching their offspring how to hunt (families), a species of coral growing in an area (corals) or a population of bees cooperating to show each other food sources (social). Which relations to you recognise in the following images? - Community, the interactions between different populations in a specific area. - Biotope, the interactions of a community with ther habitat. - Biome, a group of ecosystems with similar attributes. 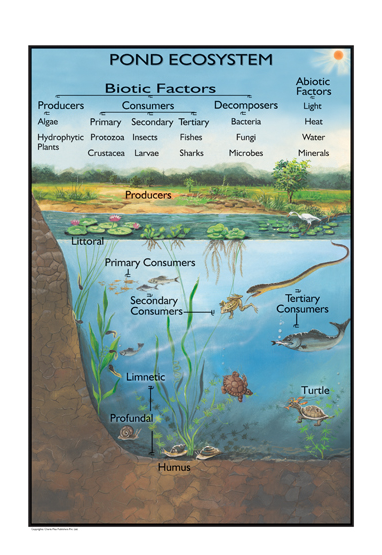 To understand the relationships within an ecosystem, it is useful to group together all the organisms of the biocenosis according to how they obtain nutrients: producers and consumers. This helps visualise the way energy moves through an ecosystem. 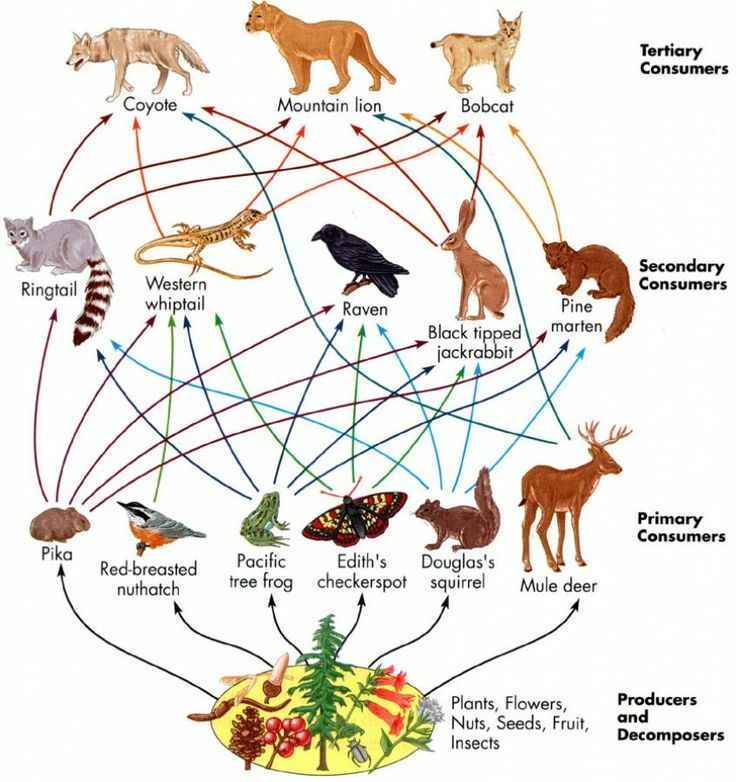 This complicated interaction is known as a food web, where a single path through the web can be called a food chain. 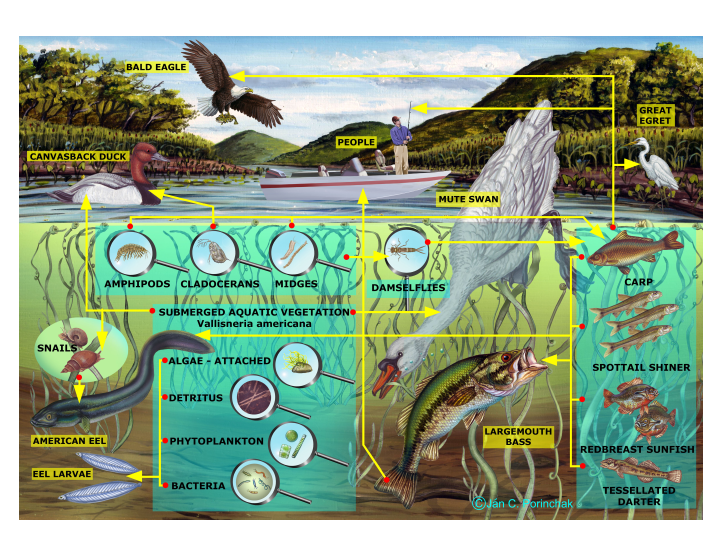 Food webs are representations of all the trophic chains in an ecosystem and how they interconnect with each other. 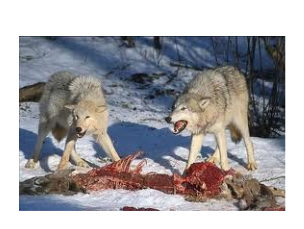 The position an organism occupies in the food chain can be thought of as its trophic level. Green plants, which obtain their energy directly from sunlight from this energy, make organic material from inorganic material, form the level of producers. Producers are autotrophs – they make their food. These are the base of all food webs. 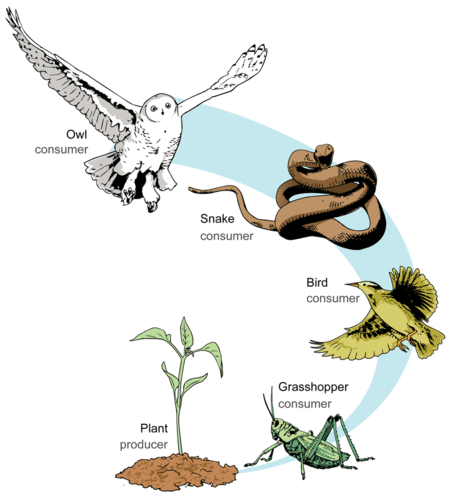 The consumers are heterotrophic organisms. Primary consumers feed on plants (the producers), these are called herbivores. The secondary consumers feed on the primary consumers. The tertiary consumers feed on the consumers from the level below. 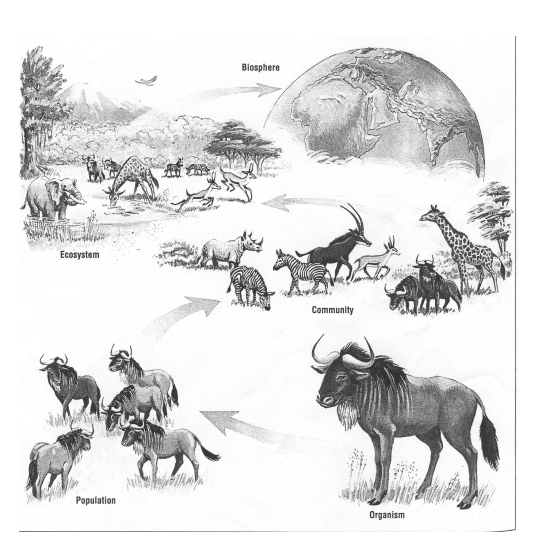 Many animals belong to different trophic levels. 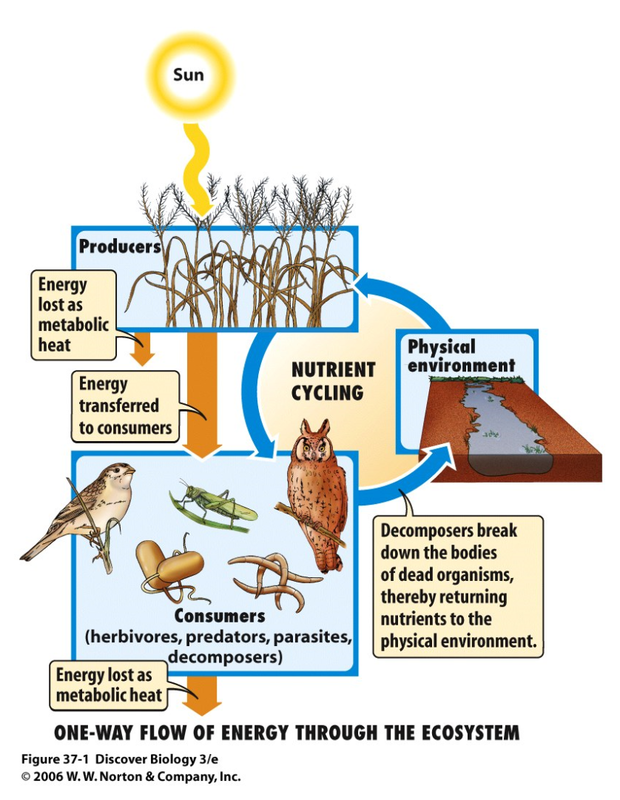 The decomposers obtain their energy from the chemical decomposition of dead organisms or from the waste products of plants and animals. They are above all, bacteria and fungi. The role they play is vital, they return the organic material to the environment as inorganic material, so that it can be re-used again by plants. The energy enters an ecosystem by the Sun. Some of that energy reaches the producers and drives the process of photosynthesis but only a small part of that energy is stored in their bodies. All organisms use energy for their life processes, to grow, interact, move etc. and that energy will leave their bodies as heat. So when they are eat every time less energy reaches the next level in the food chain. 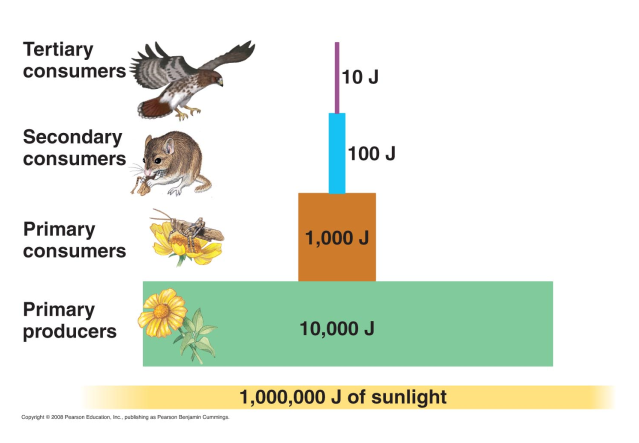 More or less 10% of the energy passes on to the next level in the chain, the other 90% is used by the organism. The flow of energy through an ecosystem in an open cycle, energy gets lost from it. The flow of matter in an ecosystem is different, this is a closed cycle. Matter does not enter nor exits the biosphere (with exceptions) so matter needs to be recycled. The aim of the game is to try and make the healthiest ecosystem you can by adding different species each day. You can only add 5 populations per day, and you can add more than one population of the same species if you want. A good score for your ecosystem at the end of the game is anything over 1000 points. 2. Draw a food web showing how the different food chains are linked. ​5. At the end of the game, write a summary of what you learned. What does a healthy ecosystem need.? How can we represent the quantitative data of each different trophic level in a food chain? As a single tree can support many organisms, this food chain produces an unbalanced pyramid. Measuring the biomass at each trophic level can give a more accurate picture. Biomass is the mass, fresh or dry of living things per unit of area (for terrestrial communities), or unit of volume (in aquatic communities). 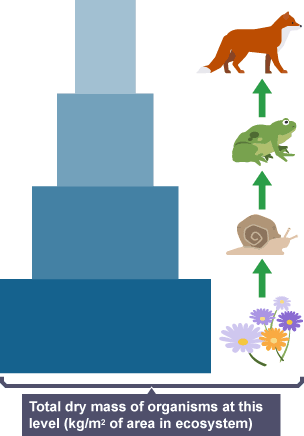 At each trophic level, the amount of biomass and energy available is reduced, giving a pyramid shape.